One aspect of the documentary films I’ve seen this year at Hot Docs and Inside Out Festival, is the use of musical score to add drive and liveliness to the overall storytelling. While feature films are turning to cheaper synth style music for their scores, there are a few documentary films that manage to use original music to add energy and narrative drive to their films. Music if done improperly can conflict with the story or take the audience out of the film. However, when the music compliments visuals, it helps elevate the tone, connects thematically to the story, as well as creates a stronger emotional impact. I have highlighted three documentary films that used musical score effectively at this years Hot Docs and Inside and Out Festival. 3 Siblings: Sheena Rossiter’s documentary short film takes place in São Paulo, Brazil which still is a very homophobic city despite having one of the largest Pride Parades in the world. 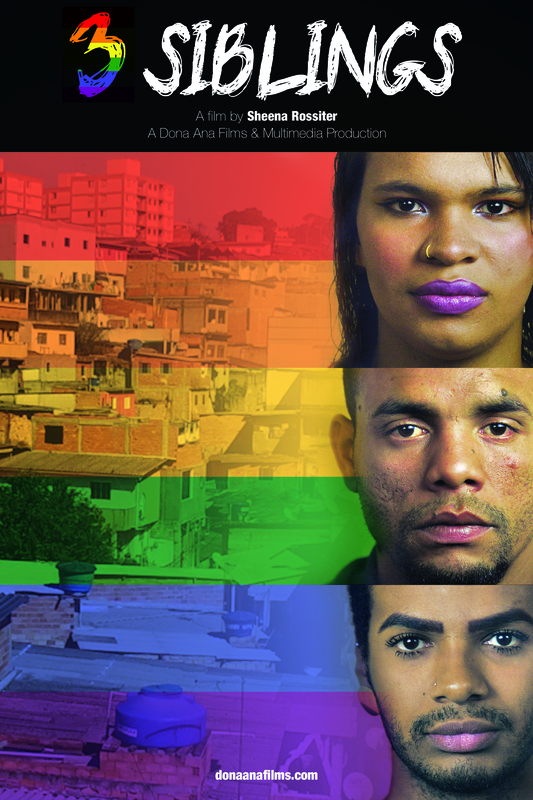 The film follows three Brazilian siblings Ludmylla, Victor and Angelo who sit at various ranges along the Kinsey scale. Ludmylla is transgender, Victor is gay and Angelo is a heterosexual cis-straight male. When Ludmylla and Victor take their black sheep straight sibling to his first Pride Parade, Angelo grows to understand and celebrate the LGBTQ community for being out and proud. This film mainly focuses on separate formal interviews with each sibling and only shows them interacting with one another in the last half of the short. What is lacking overall within the film is the love and connection between the siblings. Perhaps more interaction scenes as well as interviews with all the siblings together could have rounded out the perspective rather than compartmentalized the points of view within the film. However some documentary shorts like the Canadian film My Enemy, My Brother started as a short film and then got expanded to a feature length documentary. 3 Siblings could have the same opportunity, since it is a fascinating film with current and prevalent subject matter. One of the strongest aspects in the short was the percussive brazilian music underscoring the opening sequence of each of the subjects walking through the streets of São Paulo. Not only did it amplify who these subject are by watching then walk through space, but it added an internal heartbeat to the narrative. The music is fun and I found myself dancing in my seat while watching. Despite the possible threat of the LGBTQ community being attacked by far-right nationals, the sense of pride and resilience is felt by the audience, thanks in part to the uplifting musical score. Exit Music: Like the title suggests, Cameron Mullenneaux film captures the music of subject Ethan Rice as he slowly dies of complications with cystic fibrosis. It’s a painful film to watch, but is balanced with creativity and humor. In order to pass the time Rice goes to concerts, makes short animation films using his miniature army men, and composes music on his electric guitar. Mullenneaux captures Rice struggling to live and joking along the way that he will soon be gone. However his body and his spirit keep going much longer than was originally expected. The film is a mix between interviews within Rice’s house as well as a fly-on-the-wall style allowing the audience be absorbed in Rice’s world. The interviews aren’t staged or formal. They are very relaxed and you feel like you are watching a close friend. The subject matter is handled with subtly and sensitivity without making it too saccharin. Rice comes from a working class and it was particularly moving to see how much Rice’s parents sacrificed their own dreams to allow their son to live. Woven within the transitions and within the film is Rice’s original music. Mainly composed on electric guitar the ballads add a haunting quality to the film. The music is mostly played in minor chords and is a constant reminder of Rice’s struggle. The compositions are a way Rice can express himself creatively, and allow himself to write his very own swan song. This film and his music will live long after Rice takes his last breath and it’s a pleasure to witness. Honorable mention: Golden Dawn Girls’: Håvard Bustnes, chronicles the rise of the Nationalist party in Greece and it’s absolutely terrifying. If someone needs a prime example of the post-truth world then look no further than the ideology of the Greek Neo-Nazi party. Bustnes follows the rise of the party to become the third largest political party in Greece as well as the increased power of its female leaders. Even though the film didn’t use a lot of music, there is a one key underscoring scene where the members attend a baptism. The symbolism of baptizing new members of the Nationalist party and the expanding generation of Neo-Nazi’s is emphasized by the ominous music underneath. It’s adds to the terror of this small party becoming unstoppable in Greece and it is a painful reminder of history constantly repeating itself. 93Queen: In America’s largest Hasidic community in Borough Park, Brooklyn, a woman by the name of Rachel “Ruchie” Freier wanted to organize an all female ambulance corp, since up until that point there has been only a all male volunteer service. The main urgency has to do with Hasidic women feeling much more comfortable calling a female service when they confront an emergency, since only their husband can see or touch their bodies. This may sound like a quirky premise that you would see on a sitcom, but director Paula Eiselt captures Freier’s courageous and ambitious journey to create a safer and more comfortable service for women. The film is mainly a fly-on-the-wall style documentary that allows Freier to lead the action of the story. Not only is she trying to organize the EMT service, she works as a lawyer, is running for City Court Judge, be a leading member of her Hasidic community and prepares all her meals for her family. Anyone who complains about not having enough time to do things should be taking notes from Ruchie Freier. She’s a positive role model in terms of balancing her own religious beliefs with her personal and career ambitions. Throughout the film music is constant. There is violin orchestration that brings energy and a quickness of pace to the screen. Every piece helps keep the audience’s attention as well as compliment Freier’s drive and ambition. The end song in Yiddish is particularly empowering. “Eshet Chayil,” translates to a woman of valour, which is traditionally sung by a Jewish husband to his wife on Friday night for the Sabbath. The opening line translates to, “A woman of valour, who can find?” It’s very rewarding to have this song sung by the a woman at the end of the film as a gesture to the religious traditions and the overall feminist message of the film, since Freier, (an reluctant feminist hero,) helped break the mold on some of the outdated traditions within the community. 3 Siblings is playing as part of the Inside Out Festival, June 2nd @ 1:45 as part of a collective of short films. Please visit insideout.ca for ticket information. 93Queen will have a US release this summer, as well as airing on PBS in the fall. For information about Golden Dawn Girls please visit goldendawngirlsdoc.com. Visit exitmusicfilm.com for more information about Exit Music.